St. Paul is famously difficult to understand. A new film helps change that. Paul is a difficult character to understand. Scripture contains his thoughts on many topics but says comparatively little about the motivations behind them. In this, Paul differs from other biblical characters, whose inner life is part of their story. For example, the Gospels depict Peter, arguably the only apostle equal to Paul in importance, as someone whose faith only barely overcame his self-doubt. With Jesus’ encouragement he walked on water, but only for a moment before his fear of the storm overwhelmed him. The weakness of characters like Peter has a spiritual value. It gives readers a point of identification with someone who overcame their inner turmoil and developed a deeper trust in grace. “Paul, Apostle of Christ” is a fascinating study of Paul’s encounter with grace. Paul admits such weaknesses, but his extraordinary self-confidence can obscure them. This might be due to his Greek intellectual environment, which emphasized the importance of sōphrōn, the virtue of self-control. Mature individuals projected self-mastery and did not speak of their weakness. So although Paul spoke of his “thorn in the flesh,” he did not give specific details. Similarly, when Paul faced his own storm at sea, he told his shipmates, “I urge you now to keep up your courage; not one of you will be lost, only the ship. For last night an angel of the God to whom I belong and whom I serve stood by me and said, ‘Do not be afraid!’” (Acts 27:22-24). This is a stark contrast to Peter, and it can be a challenge to identify with a person of such fearless self-control. The great achievement of the film “Paul, Apostle of Christ”is its effort to explore the inner life of the man who could speak such words. Whatever the film’s cinematic merits, it is a fascinating study of Paul’s encounter with grace. The work is a production of Affirm Films, a division of Sony that produces movies with themes that appeal to Christian audiences. The filmmakers imagine Paul’s imprisonment during Nero’s persecution (AD 64-68), depicting it with all the grisly details found in Tacitus’s Annals. 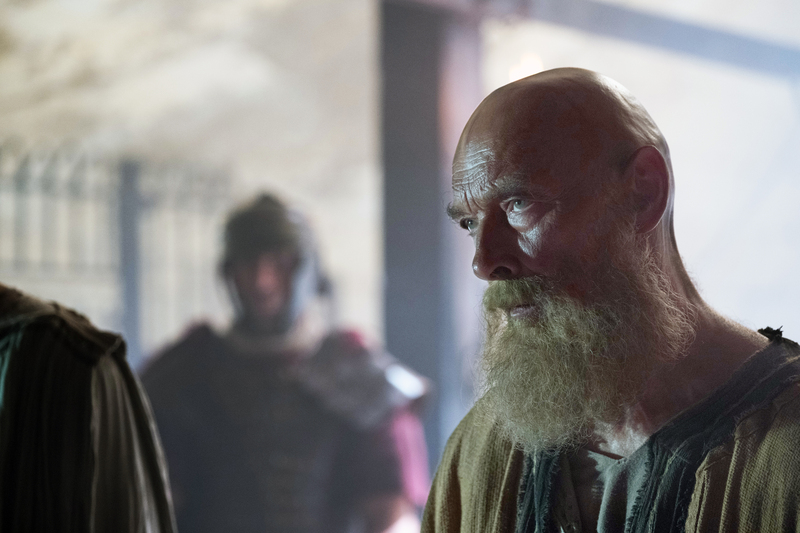 The conversations between Paul and the other characters allow the filmmakers to explore aspects of the apostle’s character that are otherwise difficult to see. These explorations reveal a man who, although fearless, was also profoundly humble, who inspired others with his confidence and whose life was irrevocably transformed by Christ’s love. “But we hold this treasure in earthen vessels, that the surpassing power may be of God and not from us” (2 Cor 4:7). Paul’s humility comes out most clearly in his conversations with Mauritius, the soldier who ran the Mamertine prison. Mauritius embodies Roman culture; he is proud, severe, superstitious and cynical. Mauritius’ daughter is dying of a mysterious illness, and his prayers to the goddess Bona Dea have gone unanswered.Hearing of Paul’s reputation as a healer, Mauritius summons him, but when Paul explains that he has no power except that which Christ confers, Mauritius hesitates, fearing that trust in Christ would anger Rome’s gods and exacerbate his daughter’s condition. As Mauritius gathers more evidence that Paul is a miracle-worker, Paul intensifies his claim of powerlessness, even boasting of his weakness. Mauritius has no patience for this, “Very few men admit weakness; certainly none boast of it!” Yet Paul does, eschewing any credit for the good that comes from his efforts. The filmmakers also trace the way that Paul’s own trust in grace inspires similar trust throughout the Christian community. The film highlights the service one provides to others with simple but infectious trust in God’s love. Paul believed in God’s infinite power, and others found the strength to do as well. “Now to him who is able to accomplish far more than all we ask or imagine, by the power at work within us, to him be glory in the church and in Christ Jesus to all generations, forever and ever. Amen.” (Eph 3:20-21). Some of the the film’s most affecting moments come when Paul attempts to explain the source of his zeal. Some of the the film’s most affecting moments come when Paul attempts to explain the source of his zeal. He describes his conversion as a moment of being “completely known and completely loved.” The film reveals his “thorn in the flesh” to be the guilt he continues to experience over his former persecutions. His role in the death of a child weighs especially heavy on him, and makes him uncomfortably similar to the Romans who kill a Christian orphan early in the film. The road to Damascus set Paul on a different path. To receive Christ’s mercy and be loved by those he himself had hated shook him to his core. Over time it evoked a similar love from him. This growing love quieted his fears and drew him into lifelong service to Christ and the church. Near the climax of the film, Paul’s fearless love inspires a similar love in Rome’s Christians, who risk arrest in the effort to save Mauritius’s daughter. Thus, the film reveals Paul’s motivation to be his astonishment that Christ could love him in spite of his crimes. His transformation came not from a punishing humiliation, but from the power of Christ’s dreams. His fearless zeal was his response to this act of grace. In the film, we see Paul live out the transformation described in Corinthians: “When I was a child, I used to talk as a child, think as a child, reason as a child; when I became a man, I put aside childish things. At present we see indistinctly, as in a mirror, but then face to face. At present I know partially; then I shall know fully, as I am fully known. So faith, hope, love remain, these three; but the greatest of these is love” (1 Cor 13:11-13). Is the church a woman with a male head? We need women priests and women bishops. The question is whether St Paul was stating God’s will for all the Church in this age or was stating his own will for congregations dealing with new believers from various ancient cultures. Reasonable people may disagree about the better answer to that question. “Patriarchal gender ideology is an obstacle to integral human development” and “Religious patriarchy is a cultural tragedy that is becoming a doctrinal travesty” raise secular utilitarian considerations that are relevant but not decisive. I believe that Paul probably intended to state how he would have congregations deal with local and temporary problems, but this belief of mine is grounded on much more than judgments about general welfare. Using the Bible or how Man assigned what to what gender is not a logical cohesive way to approach the "Women should be Priests" idea - The Catholic Church is Protestant more and more with each passing day hence hey "why not" - Who do we think we are "More Protestant than the Pope"
Jim Caviezel "Shut up and Act"
I saw the film today, thought it was well worth seeing and hope it draws a good audience. However there were very few people in the theater. It will probably have a short run. But it would be good for parishes, bible study groups, etc. to feature it in special showings. Somehow I never was even thinking about patriarchal covenant while watching it. Great Blog.You revealed best of St.Paul.Medical billing services in florida very much impressed by your blog.Thank you. Michael R. Simone, S.J., America’s Word columnist, is an assistant professor of Scripture at Boston College School of Theology and Ministry.